Stateline Campresort is one of Southern New England’s finest vacation destinations. 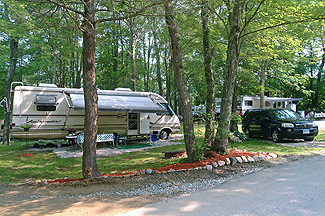 Our sites are both spacious and scenic, designed to accommodate everything from tents to today’s largest RV’s. Full hookups are available, along with group sites, and both seasonal and monthly site rentals for longer-term stays. Cabin rentals are a popular option for people who do not own their own camping equipment but would like to sample the camping experience. Reservations are highly recommended, with reservation requests easily made online using the form below. These sites can accommodate 1 tent (or two tents for a small daily fee) and at least one vehicle. Sites have a fire ring and picnic table. No electricity available on the actual site. Electricity and water available at nearby bath house. These sites can accommodate 1 tent and/or 1 trailer (an additional tent can be added for a small daily fee) and 1 vehicle. Sites have 20 or 30 amp electric, water, grey water galley, fire ring and picnic table. Dump fee for black water included. No sewer. Water view sites available for a small fee. These sites can accommodate 1 tent and/or 1 trailer (an additional tent can be added for a small daily fee) and 1 vehicle. Sites have cable, 30 or 50 amp electric, water, grey water galley, fire ring and picnic table. Dump fee for black water included. No sewer. These world class sites are our best! They include a BBQ charcoal grill, custom brick fireplace, picnic table, cable, sewer, and 30 or 50 amp electric. Closest sites to pool and main lodge. Limited availability. Any standard (W, E & G) site* is only $30.00, Sunday thru Thursday! * Additional charge for waterfront. 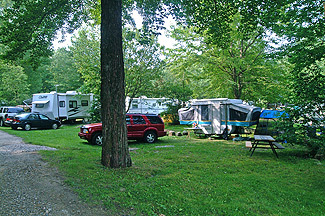 Base rates include 1 camping unit, 1 vehicle and a family of 4 (2 adults and 2 children ages 5-17). All children ages 4 and under camp free. All rates include air conditioning usage, use of our dump station, and free wi-fi where available. (Wi-Fi: Due to the rural nature of our property, we cannot guarantee continuous or uninterrupted Internet service. For those requiring constant Internet access, we recommend the use of a personal data card. This is a shared, open system, so please use common courtesy and minimize bandwidth use. Wi-Fi available at Café and Pavilion.) Registered pets are welcome for a daily fee. All pets must have a rabies certificate on file. Additional fees may apply. Firewood $7.00 per bundle or 3 for $18.00. No outside firewood permitted on the grounds. Visitor check-in / check-out: Day visitors must check-out by 8:30 PM or lose deposit and pay additional fees. Check-in Time: 3:00 PM - Please note: NO check-ins after 9:00PM. NO EXCEPTIONS! Payment: Most credit cards accepted. Full payment must be made at time of reservation. YOU ARE CHARGED AT THE TIME OF MAKING A RESERVATION. WE ARE NOT “HOLDING” RESERVATIONS WITH CREDIT CARDS. ONCE YOU GIVE YOUR CREDIT CARD NUMBER, YOU ARE GIVING STATELINE PERMISSION TO CHARGE YOUR CARD FOR YOUR STAY. You can now make your Stateline Campresort reservation requests online … for your choice of campsite. Simply complete the form below. Please understand that this is strictly a Reservation Request Form. You do not have an actual reservation until it has been confirmed, and a reservation cannot be confirmed until your deposit or payment in full has been processed and authorized. For your convenience, we accept Visa, MasterCard and American Express cards. We will contact you within 24 hours via either e-mail or telephone to confirm availability and to obtain a credit card number to secure your reservation. If you need to confirm your reservation immediately or would like to make a reservation for an arrival within less than 48 hours, please call us at (860) 774-3016 during normal business hours. Full payment must be made at time of reservation. If space is not available, we will contact you via e-mail. If you prefer, you may print this page after completing the form. The completed form may then be mailed to us with payment in full. Important: You9 may 5be making u1se o2f a1utocmated form-fi6lling asoftw9are. 7This8 tyf3fpe o0f software dcane 2t1rigger 5our h3i0dden0 2spam985-detecctiobn sys2tem, cw6bhich will block you from 3subam0itting thi3s form. Ift appears th9a92t the p6roblem 6could enot 5be aeut5omatdicallyd correabc1ted.7 Please c1lear4 eany fieldd which appears above bwith corresp2ondding instruceftdionsd2436083 8bf17f7273fe0fc872dd1b9fc60ecd641a3318eo580rbce0963ee4b917c96c 9complfeting768 th4e fo4rm i3dan or6de1e7e4r to co6r0bdr2ecta the2 cpro3b1lem3e.f3 W7e7c91 a5p3eolao3gize32 faor1 the inabco668nven6iencecb and 0we appre0cei0ateb yofur und85eee1r3standifng.